Online registration has closed. Please register at the CCCC at 6:30 a.m. on Race day if you'd like to participate. The 2018 Oktoberfest 5K/10K Run is sponsored by Sidney Regional Medical Center. It will begin at the Cheyenne County Community Center, 627 Pole Creek Crossing, Sidney, NE 69162 and will end at the Oktoberfest Tent located at the Cheyenne County Fair Grounds. Participants are encouraged to park at the Fairgrounds. Busses will be available to shuttle participants to the race start. Bag drop will be available during the race. Participants receive support from volunteers along the well marked route. The race will start at 7:30 am. 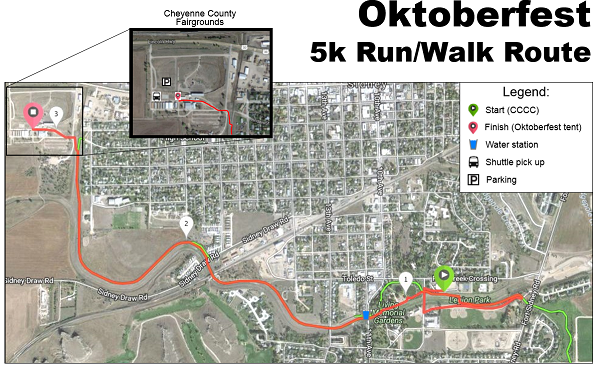 COURSE: A point to point 5K and 10K race - both beginning at the Cheyenne County Community Center (CCCC) and ending at the Cheyenne County Fairgrounds (site of the Oktoberfest festivities). The course will be on gravel and cement, with the majority being on paved trails. BUSES: Buses will leave the fairgrounds at 6:30am, 6:45am and 7:00 am. If you miss the last bus, you will be responsible to get to the CCCC for the start of the race. Runners are encouraged to take the early bus to allow adequate time for bag check, stretching, hydration, etc. BAG DROP: Bag drop-off will be provided at the CCCC and bags will be delivered to the Oktoberfest tent for pick-up after the race. Runners are strongly encouraged to use the zippered goodie bag and luggage tag provided for the bag drop. You will receive this at packet pick-up. Please mark the luggage tag or your bag with your bib number. Not responsible for lost or stolen items. WATER STATIONS: There will be one (1) water station along the 5K route and two (2) water stations along the 10K route along with water and Gatorade at the beginning and end of the race. ID's are REQUIRED at the tent for beer. Check out the race route for 2018! 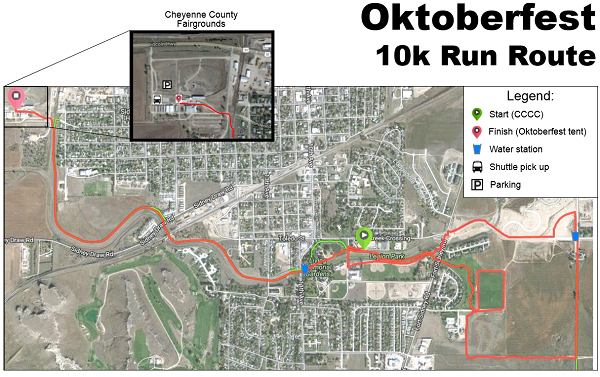 Race packets will be available for pickup at the Cheyenne County Community Center, Friday,October 6th, from 5-7 pm before the race. Packets will also be available for pickup the day of the race at the Community Center. PARKING: Parking is provided and encouraged at the Cheyenne County Fairgrounds the morning of the race. Please utilize the field on the north side near the tent. School buses will be available to transport runners to the CCCC where both the 5K and 10K races will begin. Parking is also available at the CCCC . However, there will NOT be transportation provided back to the CCCC after the race. If you choose to park at the CCCC, you will need to make your own arrangements to get back after the race. Pretzel bar, bananas and oranges will be provided at the finish inside the tent along with water/Gatorade. Runners 21 years of age and older will have a tear off tab on their bib to turn in at the tent that is good for one free beer. ID IS REQUIRED. Runners under 21 years of age will have a tear off tab on their bib to turn in at the Shaved Ice Stand that is good for one free shaved ice. Free drink must be redeemed by 5 p.m. on Saturday, October 6, 2018 if you chose to participate. No pets allowed on the course. Also, no headphones due to parts of the course being on roads so you will need to be able to hear for traffic and directions from volunteers. Strollers are allowed, but must begin at the back of the starting line. Also, note that portions of the course are on gravel. When this page loaded, the official time was 7:55:33 AM EDT.